I love love love to make Pizza. 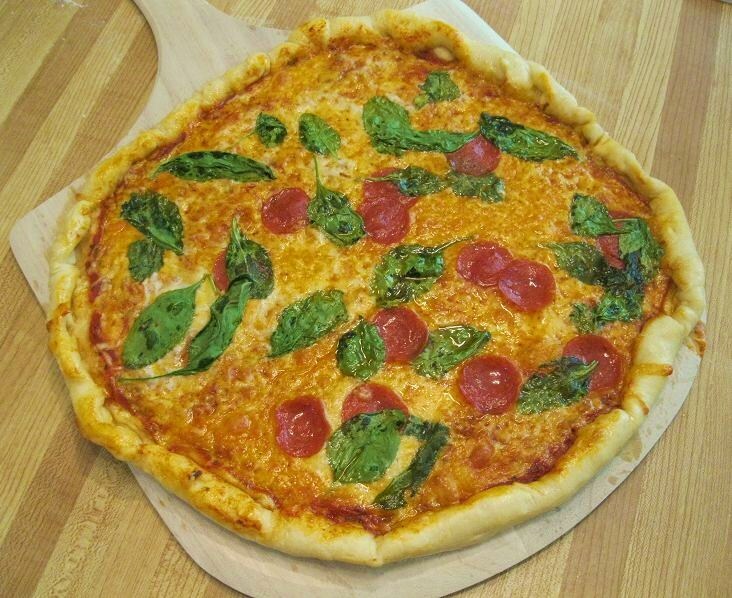 To me, a perfect homemade pizza with perfect crust is a work of art. Making your own pizza is simple and inexpensive. You get to control the toppings. This makes homemade pizza healthy (if you want it to be) or as decadent as you like! I have worked several years trying to perfect my pizza crust recipe. This is, by far, my favorite. 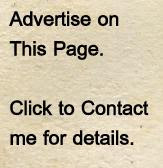 Best of all... it is easy and inexpensive! This recipe will yield enough to make (2) 12 inch round thin crust pizzas or one large cookie sheet sized pizza. (1) Mix 1/4 teaspoon of sugar into the warm water. (2) Sprinkle the yeast on top of the water and wait until the yeast foams (approx. 10 minutes). (3) While you are waiting for the yeast to foam, combine the flour, salt and olive oil into a large bowl. (4) Pour the foamed yeast, water and sugar into the other ingredients and lightly mix it all together. (5) Knead the dough for 2-4 minutes or until it is smooth and elastic. You may add a pinch of flour to your hands if it sticks. (6) Cover the dough with a towel and let rest somewhere non-drafty for 30 minutes. (7) Preheat your oven to 425 degrees. Lightly grease two 12-inch pizza pans or one large cookie sheet or prepare a pizza stone by preheating it from a cold oven. If you are making 2 round pizzas, divide the dough into 2 equal parts. (8) On a flat floured surface, combine rolling out the dough with a rolling pin and using your fingers to stretch the dough until you get your desired shape and thickness. 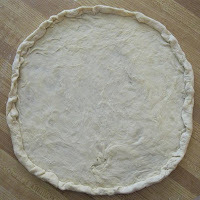 Roll the edges in a bit to make a crust. (9) Pre-bake the dough at 425 F for 10 minutes (you do not need to do this if you are using a pizza stone). (10) Spread your pizza with sauce and the toppings of your choice. Brush the crust lightly with olive oil. (11) Bake at 425 F for 10-20 minutes or until the pizza is cooked how you like it. 2 1/4 teaspoons of yeast is equal to 1 (1/4 ounce) package of yeast. I prefer to buy my yeast in a glass jar instead of packets. I had always been told that the yeast in jars stays fresher then the paper packets. I am not sure how true that is, but I do know I have occasionally had trouble with yeast in packets not always rising properly. This recipe makes a thin crust pizza. If you like a thicker crust use more then 1/2 the dough per pizza. If you don't want to use all the dough in this recipe, you can freeze it for later. Spray the unused risen dough with non-stick spray and then place it in a freezer bag. Allow the dough to thaw before using it. When I first started making pizza, I used this recipe to make one large cookie sheet sized pizza. Using a cookie sheet is a good start and tastes great, but if you really desire a crispy crust you will need to invest in a pizza stone. Pizza stones range anywhere from $15 to $100 dollars. I own the inexpensive one to the left and it works just fine. Cheaper thinner pizza stones can do just as great a job as the more expensive thicker ones, but occasionally people are disappointed with them when they crack. If you don't want your pizza stone to crack, it is important that you remove the pizza from the oven WITHOUT removing the stone. Use a pizza peel to remove the cooked pizza and then let the pizza stone stay in the oven to gradually cool while the oven cools. Its thermodynamics, but this instruction is often not included on the directions that come with pizza stones. If you use a pizza stone, make sure you put a good amount of cornmeal on your pizza peel, so your pizza slides easily from the peel to the stone. Nice article and good tip about leaving the stone in the oven to cool down gradually. The stone that I use came from the author in fact and is the same one in the left picture. It works well. I have always bought the dough from out local grocer but once I find the jar o' yeast, I will be doing it this way!! another suggest too, if you want a stone you can also buy from Home Depot or other supply places..Unglazed Quarry tile.. measure your oven first then go with your measurement and buy the tile.. I have bought 4 squares and used them for years..cheaper to replace..last Christmas I bought my "first" stone..:) and I've been making pizza for over 50 years :)..God Bless Zeee..just another helpful hint..God Bless and enjoy your pizza bread and what ever else you'd bake on your stone !